Amy's Earth Houses are set in the most beautiful surroundings. 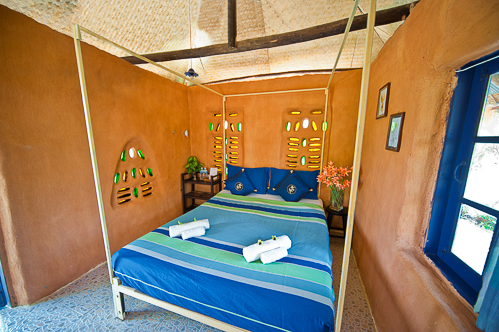 All of our mud houses have private bathrooms with hot showers and are equipped with TV and fans (air conditioning is unnecessary due to the natural building style). The dormitories (two three-bed and one double-bed room) have a shared bathroom and toilet. The dormitories have fans. We have free WIFI throughout, although the signal is strongest in the communal areas. Free pool table from 08:00 to 20:00. Our restaurant is open from 08:00 until late and is reported to have some of the best food in Pai — Some have even said South East Asia! Our tree house officially has room for eight people. … and serve you too. We charge between THB 5 and 10 per article for washing. Ironing costs extra. 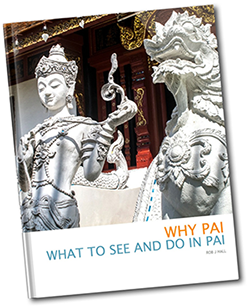 Our transfer-service from or to Pai airport/bus-station is free of charge. Our taxi-service will take you to any of the local spots at a reasonable price. We charge THB 100 for the run into town between 09:00 and 21:00 after 21:00 we charge THB 200.